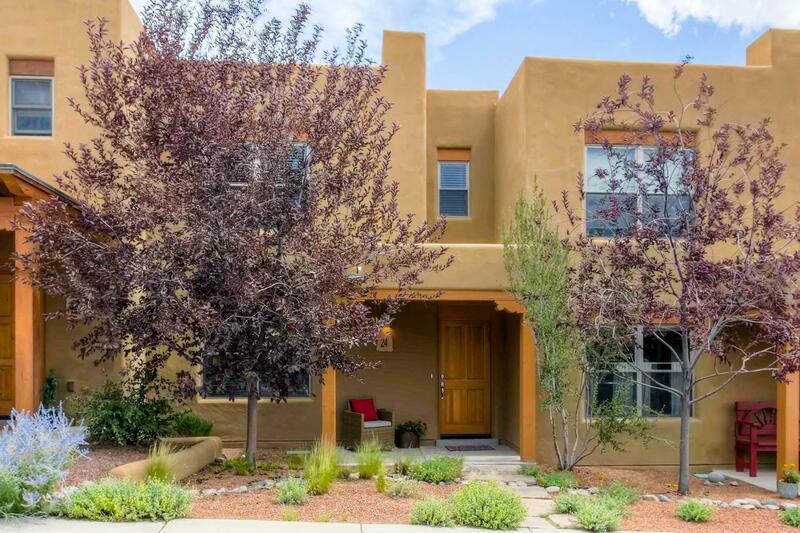 This charming, thoughtfully-designed townhouse offers buyers the rare opportunity to live in Aldea de Santa Fe, one of Santa Fe&apos;s most coveted communities. Listed at $254,900 this property represents one of the most affordable options in the surrounding area. Backing-up to lush, green open space and big blue skies, with nearby walking trails, tennis courts, clubhouse and coffee shop, a homeowner will enjoy all the perks of a pedestrian-friendly community, while being only a quick drive to Downtown Santa Fe. Downstairs this well-maintained townhouse is complemented by an open floor plan with gorgeous hardwood floors, spacious, highly-functional kitchen, designated laundry room and powder room. Upstairs you'll find two bedrooms with views and one full bathroom. Rounding out the property is a fully-fenced, easily-maintained brick courtyard, two off-street parking spaces and views of mountains on the horizon, perfect for relaxing Santa Fe evenings or entertaining with guests. This Aldea home uniquely offers a variety of ownership options, such as an affordable, conveniently-located, primary residence, or a fantastic lock-and-leave vacation home. Only 5-minutes from NM-599 this property is an easy, scenic commute to Los Alamos and Albuquerque. With very few homes available in Aldea this property is sure to grab people's attention! Act quick! Directions To Property: Nm-599 Frontage Road To Avenida Aldea, Turn Left Onto Vista Precioso. Property Will Be On The Left.